BACKGROUND: The cavernous sinus communicates with several para-cavernous sinus venous structures, receiving blood flow from the superficial middle cerebral vein (SMCV), the sphenoparietal sinus (SPS), and the superior ophthalmic vein, and draining into the superior and inferior petrosal sinuses and pterygoid and basilar plexuses. Anatomic variations of these veins have been previously reported; however, some details, such as the relationship between the SPS and the SMCV, are incompletely characterized. The anatomic variations of para-cavernous sinus veins, especially drainage patterns of the SMCV, were evaluated on MR imaging. MATERIALS AND METHODS: Thirty-seven patients, including those without any lesions affecting the cavernous sinus or para-cavernous veins and patients with carotid cavernous fistulas, were examined by using fat-suppressed contrast-enhanced 3D fast gradient-echo MR imaging. Two neuroradiologists evaluated the images on a viewer, regarding the normal anatomy and the pathologic findings of the para-cavernous sinus veins. RESULTS: The fat-suppressed 3D fast gradient-echo MR images clearly depicted the para-cavernous sinus venous structures in all patients. SMCVs had 4 variations in the drainage patterns. The most frequent pattern was drainage into the SPS (39%), and other types were draining into cavernous sinus, pterygoid plexus, and tentorial sinus. The SPS had 3 variations. The most frequent pattern was drainage into cavernous sinus (72%), and others were the hypoplastic type or those draining into pterygoid plexus. CONCLUSION: The fat-suppressed 3D fast gradient-echo MR image is useful for evaluating the venous structures in the skull base. Knowledge of the variations is important for diagnosis and endovascular treatment of the cavernous sinus lesions. The cavernous sinus communicates with several para-cavernous sinus venous structures, receiving blood flow from the superficial middle cerebral vein (SMCV), the sphenoparietal sinus (SPS), and the superior ophthalmic vein and draining into the superior and inferior petrosal sinuses and the pterygoid and basilar plexuses. Some anatomic variations are found in the confluence patterns of such venous structures; however, some details, such as the relationship between the SPS and the SMCV, have been incompletely characterized. The SMCV, for instance, typically empties into the SPS at the lesser sphenoid wing; however, some surgical and anatomic studies have reported the existence of anatomic variations,1–5 and these patterns have been given various labels.1–7 In addition, one recent anatomic corrosion cast study reported no existence of the SMCV draining into the so-called SPS.8 The cavernous sinus is a site commonly involved in direct or dural arteriovenous fistulas. To diagnose such vascular diseases and consider treatment strategies, one must have knowledge of the relevant anatomic variations. In this study, the anatomic variations of para-cavernous sinus veins, especially the communication patterns of the SMCV and the SPS, were evaluated on MR imaging. We evaluated MR images of the consecutive patients examined by using fat-suppressed contrast-enhanced 3D fast gradient-echo MR imaging between March 2004 and January 2005. Among them, the patients who had veno-occlusive disease in the cavernous sinus or para-cavernous sinus veins due to tumors or other pathologic conditions were excluded from this study, and the remaining 37 patients with 74 hemispheres (15 men and 22 women; age range, 26–80 years; mean age, 57.2 years) were included in the study. The subjects comprised 2 groups: the patients having no lesions affecting the cavernous sinus or para-cavernous sinus veins, or the patients having direct carotid cavernous fistulas or dural arteriovenous fistulas. The second group with carotid cavernous fistulas or dural arteriovenous fistulas underwent transcatheter angiography and endovascular treatment after the MR imaging examinations. The underlying diseases of the former group were brain tumor in 18 patients, head and neck tumor in 9 patients, and others in 5 patients. The second group included 1 patient with a direct carotid cavernous fistula and 4 with dural arteriovenous fistulas. Fat-suppressed contrast-enhanced 3D fast gradient-echo images using 2 different 1.5T MR units were evaluated. The imaging parameters were as follows; TR/TE, 25/5.5; flip angle, 20°; matrix size, 224 × 256; section, 1 mm in 1 scanner (Excelart Vantage, Toshiba Medical Systems, Tokyo, Japan); and TR/TE, 21/2.1; flip angle, 20°; matrix size, 222 × 256; section thickness, 1.4 mm in the other scanner (SIGNA Horizon, GE Healthcare, Milwaukee, Wis). As contrast media, 0.1 mmol/kg of gadolinium chelate (Omniscan) was administered intravenously in each patient. The scanning area covered between the level of the orbital roof and the craniocervical junction. Each image was obtained in a transverse section combined with a fat-suppression technique. The images were transferred to a workstation and independently evaluated by 2 neuroradiologists with respect to the normal anatomy and the pathologic findings of the para-cavernous sinus veins. The vertical continuity of such veins was evaluated by paging the transverse images on an identical window. Each subject with no lesion affecting the cavernous sinus or para-cavernous sinus veins or with a carotid cavernous fistula was evaluated in regard to anatomic variations, focusing on communication patterns between the cavernous sinus and the para-cavernous sinus veins connecting with the cavernous sinus, and images with arteriovenous fistulas were correlated with the findings of digital subtraction angiography (DSA). The patterns of communication between the cavernous sinus and the SMCV were classified into 4 types (Fig 1): The SMCV connects with the proximal SPS and flows into the frontal aspect of the cavernous sinus (type A, Fig 2). The SMCV connects with the lateral aspect of the cavernous sinus independently (type B). The SMCV turns downward and connects with the pterygoid plexus through the middle cranial fossa (type C, Fig 3). The SMCV runs across the pyramidal ridge and connects with the superior petrosal sinus or transverse sinus via the tentorial sinus type D, Fig 4). Type A, conventionally thought to be SMCV, and type B were observed most frequently. The other types mixed with types A and B were also observed. The frequencies of each type are summarized in the (Table. Schematic drawings of variations of the SMCV. Type A, SMCV connects with the proximal SPS and flows into the frontal aspect of the cavernous sinus. Type B, The SMCV connects with the lateral aspect of the cavernous sinus independently. Type C, The SMCV turns downward and connects with the pterygoid plexus through the middle cranial fossa. Type D, The SMCV runs across the pyramidal ridge and connects with the superior petrosal sinus or transverse sinus via the tentorial sinus. SOV indicates the superior orbital vein; PP, pterygoid plexus; SuPS, superior petrosal sinus; SS, sigmoid sinus; and TS, transverse sinus. Type A, A 69-year-old man with left maxillary cancer. The SMCV runs along the lesser sphenoid ridge (white arrows) to connect with the proximal segment of the SPS (black arrows) and connects with the anterior potion of cavernous sinus (arrowhead). Type C, A 60-year-old woman with right acoustic neurinoma. The SMCV runs along the sphenoid ridge, turns downward, and connects with the pterygoid plexus via the foramen ovale (white arrow). 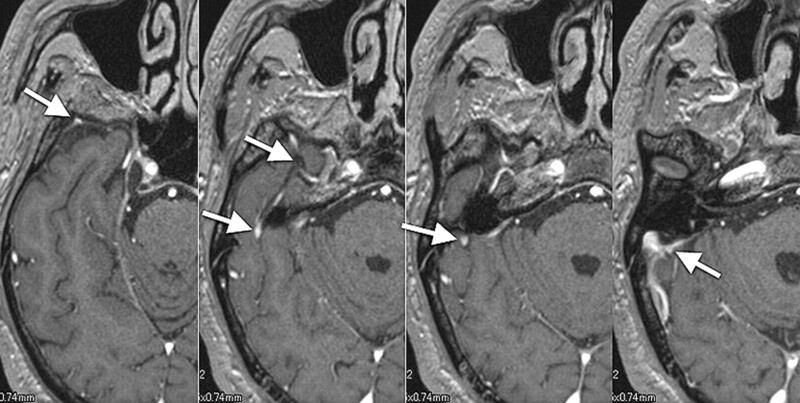 Note the hypoplastic SPS connects with the cavernous sinus (black arrow). This pattern is categorized as type C.
Type D, A 58-year-old man with metastatic brain tumor from lung cancer. Under the temporal lobe, the SMCV runs across the pyramidal ridge posteriorly and connects with the transverse sinus via the tentorial sinus (white arrows). The variations of the SPS were classified into 3 types (Fig 5): The SPS runs along the lesser sphenoid wing and connects with the anterior aspect of the cavernous sinus (type a). The SPS runs along the lesser sphenoid wing and connects with the foramen ovale plexus or the pterygoid plexus (type b). The hypoplastic SPS enters the cavernous sinus (type c). Type a was observed most frequently. The frequencies of each type are summarized in the Table. The superior ophthalmic vein could be identified in 32 patients with 64 sides. The superior ophthalmic veins communicated with the cavernous sinuses in the anterolateral aspects via the superior orbital fissures in all patients. No anatomic variation could be found in our subjects. The basal vein of Rosenthal could be also observed in some patients; however, there was no communication between the cavernous sinus and the basal vein of Rosenthal in our study. Thus evaluation of the basal vein of Rosenthal was abbreviated in this study. In subjects with arteriovenous fistula, feeding arteries and draining veins demonstrated on DSA could also be identified on MR images (Fig 6). 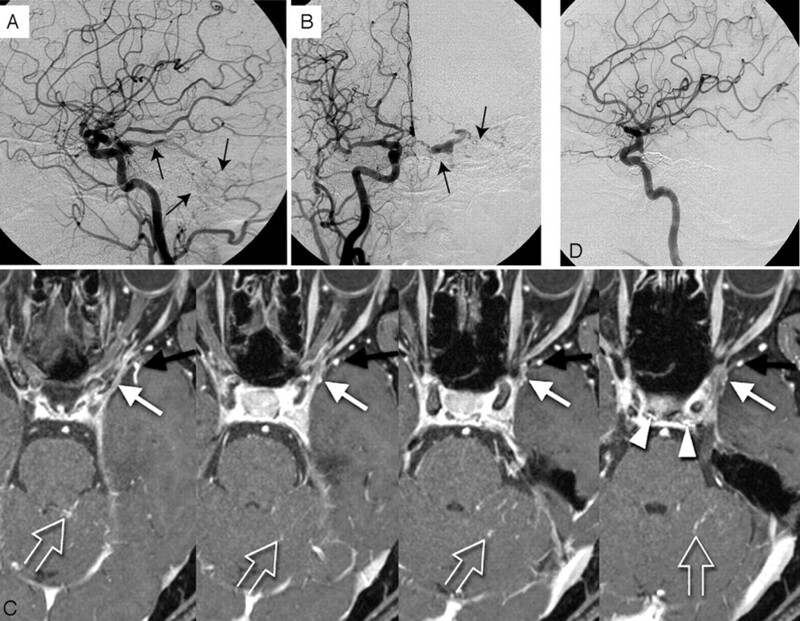 In patients with dural arteriovenous fistulas, SMCVs entering into the cavernous sinuses were clearly depicted on MR images, even if the SMCV had not been demonstrated with cortical venous reflux on DSA. The orifice of the direct carotid-cavernous fistulas could not be identified on MR images; however, drainage veins and para-cavernous sinus veins were clearly depicted (Fig 7). Mixed type with type A and B. 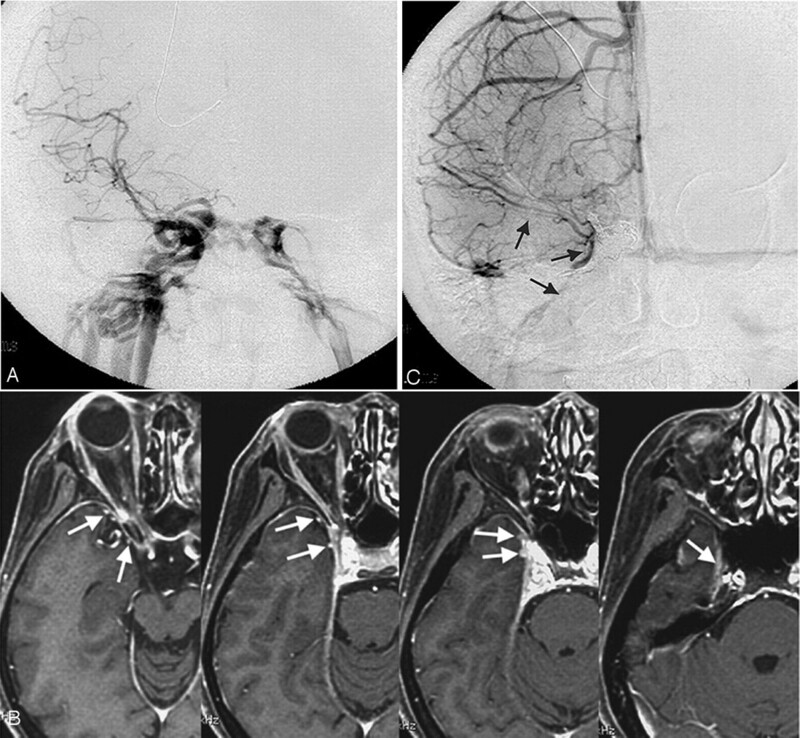 A 57-year-old woman with left cavernous dural arteriovenous fistula. A, Lateral view; B, frontal view. Right carotid arteriogram demonstrates a left cavernous dural arteriovenous fistula draining into the cerebellar cortical veins via the superior petrosal sinus (arrows). Retrograde opacification of the SMCV is not shown. C, On the contrast-enhanced gradient-echo MR image, a small venous structure connecting to lateral wall of the cavernous sinus, thought to be the SMCV, is observed (white arrow). The findings indicate the potential risk of cortical venous reflux to the medial temporal lobe. Another prominent SMCV flowed into the pterygoid plexus with no connection to the cavernous sinus (black arrow). Note the dilated inferior hypophyseal arteries joining the posteroinferior aspect of the cavernous sinus (arrowheads) and cortical venous reflux to the cerebellar veins (open arrows). D, This patient was treated by transvenous embolization, and the shunt disappeared completely. Type C, A 43-year-old woman with a right direct carotid cavernous fistula. A, Frontal view of a right carotid arteriogram demonstrates a right carotid cavernous fistula. Retrograde opacification of the SMCV is not shown. B, On the contrast-enhanced gradient-echo MR image, 2 SMCVs are conjoined beside the cavernous sinus and flow through the middle carnial fossa (arrows). This patient was treated by transarterial and transvenous coil-packing of the right cavernous sinus. C, The carotid angiogram immediately after embolization demonstrates no visualization of the shunt. Note the right SMCV flowing beside the coil mass (arrows). Padget9 described the detailed developmental anatomy of cranial veins in past reports. The cavernous sinus and other venous structures develop from primitive dural plexuses surrounding primitive cerebral vesicles.10,11 With development of the cerebral hemisphere, these plexuses fuse to form venous sinuses and cortical veins. Variations of para-cavernous sinus veins can occur in venous development. Two major primitive sinuses, the primitive tentorial sinus and prootic sinus, contribute to the development of cavernous sinus and para-cavernous sinus veins.6,12 During the early embryonic stage, the prootic sinus receives blood flow from the primitive maxillary vein, developing to the ophthalmic veins in the late stage. The cortical and pial veins developing into an SMCV are connected with the transverse sinus through a primitive tentorial sinus in an 8-week-old embryo (Fig 8A, -B). After a week, the primitive SMCV connecting with the primitive tentorial sinus is elongated anteromedially and is accompanied by the development of the cerebral hemisphere. In the 12-week-old embryo, the prootic sinus participates in forming the cavernous sinus and foramen ovale venous plexus (draining into pterygoid plexus) and receives blood flow from superior ophthalmic vein (Fig. 8C).12 After developing to the prenatal stage, the tentorial sinus connecting with the SMCV extends medially and anastomoses with the cavernous sinus and para-cavernous venous plexuses or sinuses10,11 (Fig 8D, -E). Schematic drawings of the developmental anatomy of cavernous and para-cavernous venous structures in the embryonic stage. SSS indicates superior sagittal sinus; PTS, primitive tentorial sinus; PS, prootic sinus; PMS, primitive maxillary sinus; and IPS, inferior petrosal sinus. A, Lateral view; B, axial view. In an 8-week embryo, cerebral venous structures develop from primitive dural plexuses surrounding primitive cerebral vesicles. The plexuses fuse to form venous sinuses and cortical veins. Two major primitive sinuses, the primitive tentorial sinus and the prootic sinus, contribute to the development of cavernous sinus and para-cavernous sinus veins. The primitive SMCV is connected with the transverse sinus via the primitive tentorial sinus. C, In a 12-week embryo, after several weeks, the primitive SMCV is elongated and develops anteromedially to form the SMCV as a development of the cerebral hemisphere. The prootic sinus contributes to form the superior ophthalmic vein, the cavernous sinus, and the foramen ovale venous plexus. D, Axial view; E, lateral view. 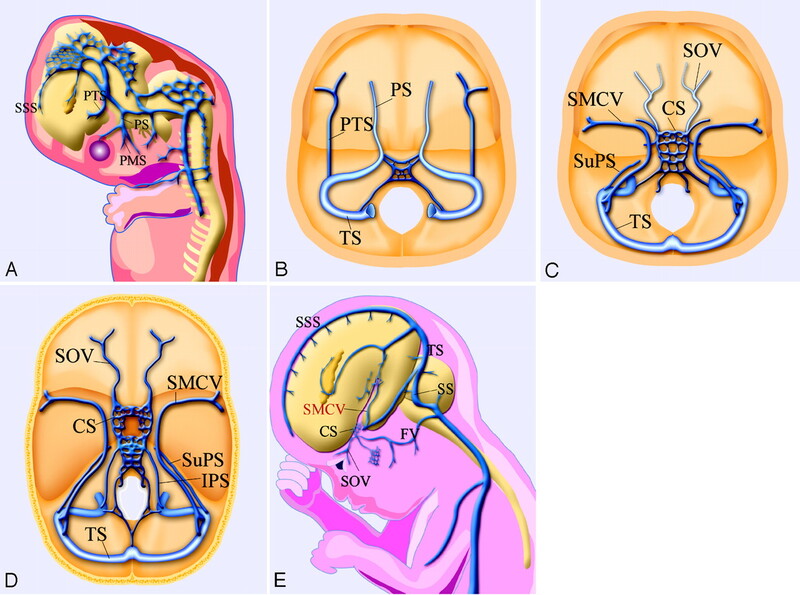 In a developed embryo, the SMCV makes further anteromedial development in the prenatal stage; however, in many patients, there is no direct connection between the SMCV and the cavernous sinus. Secondary anastomosis after birth may form a connection between the SMCV and the cavernous sinus, and the connection to the primitive tentorial sinus subsequently degenerates. Anatomic variations between the cavernous sinus and para-cavernous sinus venous structures can be formed in the course of developmental anastomosis. Among the variations, the primitive tentorial sinus performs the most dynamic conversion of blood flow to produce the SMCV. The SMCV and SPS are important venous structures serving as drainage routes from the cerebral hemisphere and meninges to the cervical venous system via the cavernous sinus; and previous reports1–5 have shown these venous structures to have some anatomic variations. Variations of the SMCV have been investigated by anatomic and surgical methods. The SMCV has generally been thought to run along the lesser sphenoid wing and enter into the proximal SPS; however, San Millan Ruiz et al8 reported no existence of an SMCV draining into the SPS in an anatomic study using an autopsy cadaver. Suzuki and Matsumoto6 investigated variations of the SMCV by using 3D CT angiography and classified some types from a developmental viewpoint. In that report, the variations of SMCV are subdivided into 7 detailed types, including the sphenoparietal, cavernous, emissary, superior petrosal, basal, squamosal, and undeveloped types; and the classifications in other reports could be included in the classification of Suzuki and Matsumoto. We classified the variations into 4 simple subtypes. The blood flow from the SMCV drains into the extracranial veins via the cavernous sinus in the former 2 types (types A and B) and drains without direct connection with cavernous sinus in the latter 2 types (types C and D). Depiction of the existence of direct communication between the SMCV and the cavernous sinus is important in diagnosis and endovascular treatment of arteriovenous fistula. In previous reports, a larger number of SMCVs directly enter into the SPS or cavernous sinus.6,7 Next evaluated is a type of draining into the pterygoid plexus via the emissary vein. Similar results were observed in our series (types A–C). These SMCV variations occur during the process of joining into the cavernous sinus or surrounding veins, and the difference in connecting points is caused by simultaneous development of the cavernous sinus and para-cavernous sinus venous system and the primitive tentorial sinus. The previously reported sphenopetrosal sinus or sphenobasilar type and our type D are the extent of communication to the transverse sinus via the primitive tentorial sinus. In cases with hypoplastic SPSs, the SMCV tends to have communication with the tentorial sinus (transverse sinus). In contrast to the SMCV, the superior ophthalmic vein develops from the primitive maxillary sinus, connecting with the prootic sinus.12 Because the primitive vein of the superior ophthalmic vein communicates with the prootic sinus forming the cavernous sinus, the superior ophthalmic vein rarely forms an anatomic variation. The superior ophthalmic veins in all our patients drained into the anterolateral aspect of the cavernous sinus via the superior orbital fissure. To our knowledge, there is no previous report about an anatomic variation of communication pattern between the superior ophthalmic vein and the cavernous sinus. The basal vein of Rosenthal develops by anastomoses of deep pial veins, and its tributaries may connect with the cavernous sinus via the SMCV or superior petrosal sinus.13 These connections have great clinical significance, especially in patients with deep venous thrombosis or other deep venous occlusive diseases. However, in our study, there were no images that depicted a communication between the basal vein of Rosenthal and the cavernous sinus. Further examination with patients having deep venous occlusive diseases is necessary for discussing the communication pattern of the basal vein of Rosenthal with the cavernous sinus. Some recent investigators have evaluated these variations by using 3D CT angiography.6,13,14 Recent improvements of the performance of CT scanners have allowed more detailed observation of the venous anatomy. However, there are some difficulties in observing vessels adjacent to or penetrating bony structures. In contrast, fat-suppressed contrast-enhanced MR imaging is feasible to evaluate skull base vessels.15 In our series, veins surrounding or penetrating bony structures could be depicted with the high tissue resolution of fast gradient-echo MR imaging. Knowledge of the variations noted here is important, not only for diagnosing several diseases involving the cavernous sinus or para-cavernous sinus veins but also for surgery of para-cavernous sinus lesions and endovascular treatment of arteriovenous fistulas. The SMCV and SPS can be a venous refluxing route in patients with arteriovenous fistulas. Even if diagnostic DSA shows no cortical venous reflux, hemodynamic changes may cause venous reflux into the SMCV or SPS in patients having potential connections among the cavernous sinus, SMCV, and SPS. For endovascular treatment for a carotid cavernous fistula, the contrast-enhanced fat-suppressed 3D fast gradient-echo MR images provide important information for decisions on therapeutic strategies and for the appropriate positioning of embolic material. There were small numbers of patients without veno-occlusive disease or with arteriovenous fistulas in this study, but the contrast-enhanced MR images provide more information for diagnosing and treatment planning of other veno-occlusive diseases, such as tumors and venous thrombosis. Contrast-enhanced fat-suppressed 3D fast gradient-echo MR images clearly depicted para-cavernous sinus venous structures in healthy subjects and in patients with arteriovenous fistulas. Several variations in the pattern of drainage of the SMCVs (eg, draining into the SPS, the cavernous sinus, and other para-cavernous veins) were noted. Knowledge of these variations is important for diagnosis and treatment strategies using endovascular or surgical techniques for cavernous sinus lesions.